The Iraqi parliament has been unusually efficient today. Although the assembly barely reached the quorum level (only 183 deputies were reportedly present), those who attended today’s session – which included a questioning of Prime Minister Nuri al-Maliki regarding his plans to reduce the size of his government – were effective enough. Whereas a previous session had ended with a lame “agreement to downsizing the government in principle”, today all ministries of state save three (provincial affairs, women’s affairs and parliamentary affairs) were abolished by a majority vote. In one way, of course, this is a positive development, because a main problem in the government that was formed by Nuri al-Maliki in December 2010 was precisely its bigness and its sprawling, unwieldy character. Criticism of unnecessary and symbolic government offices that primarily serve to augment the hubris of their holders has been part and parcel of the limited “Arab Spring” that has manifested itself in Iraq over the past half year. With fewer ministers, decision-making inside the cabinet should be made easier and, in principle at least, one of the main obstacles towards a more effective government has been removed through today’s action. At the same time it should be clear that everything that was done today represents a flagrant violation of the Iraqi constitution. That is so because the constitution does not distinguish between ordinary ministers (i.e. those with portfolio) and ministers of state (i.e. without portfolio) as far as sacking them is concerned. They should enjoy exactly the same right to individual questioning before parliament prior to a vote of no confidence, meaning that today’s en masse cancellation of around ten such ministries represents a clear constitutional violation. To add insult to injury, Maliki told parliament that “no legal problems” pertained to the process of reducing the size of the government and Iraqiyya expressed satisfaction as far as procedure was concerned. There have been vague attempts at establishing a distinction between ministries for which separate laws have already been issued and those that lack such laws (including the ministries of state). However, none of that cancels out the constitutional provisions, but so far it appears that only individual politicians like Wail Abd al-Latif and Aliyya Nusayf have even pointed out the constitutional infractions involved in today’s actions. Of course, it is not the first time the Iraqi parliament violates the Iraqi constitution, but what happened today does raise the question about the role of constitutions in states that have recently transitioned from authoritarian rule: Are they just for fun? Can their lofty principles be violated in such a flagrant way without damaging the fiction of democracy and the rule of law? As for the political aspects of today’s actions, it appears that many of the ministries that were cancelled are from the smaller Shiite parties, including the Sadrists (Abd al-Mahdi al-Mutayri and Diya al-Asadi), Fadila (Bushra Hussein) and ISCI (Hasan Radi and possibly Yasin Hasan Muhammad Ahmad). Apparently, State of Law are giving up two ministries (Ali al-Dabbagh and possibly Amir al-Khuzaie whose national reconciliation position is listed as a “ministry of state” in many accounts) and Iraqiyya two (depending on how, in addition to Salah al-Jibburi, one counts Ali al-Sajri, originally from the Unity of Iraq list that has since been enrolled in Iraqiyya, and Jamil al-Batikh whose White Iraqiyya seceded from Iraqiyya back in March). The Kurds lose the ministry of state for civil society as well as a Fayli minister of state. The ministries of state that were not abolished today are two held by State of Law (women’s affairs and parliamentary affairs) and one by a Turkmen (Turhan al-Mufti), whose party is seen as close to Iraqiyya but whose political rhetoric is often Turkmen first. The decision by Maliki to hold on to his embattled ally Safa al-Din al-Safi who is having trouble with accusations about corruption is interesting, and could indicate that he is feeling the threat of isolation within his own cabinet. In terms of people, based on a rough count, the remaining rump cabinet includes 7 from State of Law, 5 Sadrists (who increased their share during the first half of 2011 through additional appointments in February and April), 2 smaller Shiite groups (ISCI and Fadila with one each), 4 Kurdistan Alliance plus one minority representative often seen as pro-Kurdish, and finally 7 from Iraqiyya plus Sadun al-Dulaymi (whose Unity of Iraq is now technically part of Iraqiyya) as well as the aforementioned Turhan al-Mufti. Which in turn means that the lingering decisions on the defence and interior portfolios could become an even more crucial factor in deciding the political balance of the Iraqi cabinet in the coming period. Prime Minister Nuri al-Maliki, in his capacity as acting minister for interior, has issued detailed instructions for how Iraqi restaurants should adapt to the coming holy month of Ramadan which starts in early August. Most importantly, all eateries – with a few exceptions such as those clearly relating to the tourism industry – are to be closed from dawn to dusk. Maliki’s order raise interesting questions about centre-periphery relations in today’s Iraq. On previous occasions, the governorates have often taken the lead in defining holidays locally, as seen in the many local holidays that have been declared in various Shiite-majority governorates relating to Shiite festivities. Also, rules governing the sale of alcohol have largely been determined at the governorate level, as seen in places like Basra, Najaf, Wasit. Previously, the governorate of Baghdad have also passed special measures relating to Ramadan. It will be interesting to see how Maliki’s order goes down across the country. Will it be observed nationwide? What about the Kurdistan federal region (KRG), which is sometimes seen as a more liberal enclave? Of course, Iraq’s constitution does not specify any particular role for the central government in regulating commerce locally, meaning that residual powers in this respect rests with federal regions and governorates alike. But in practice – and to some extent with reference to the more restrictive provincial powers law of 2008 – a more centralistic spirit has prevailed in relations between Baghdad and the governorates than between Baghdad and the KRG during the past few years. Maliki’s order comes at the time when decisions on two other issues deemed important by him seem imminent. The first is the sacking of the independent elections commission (IHEC), supposedly to be voted on by parliament tomorrow. Maliki supporters now says he enjoys the support of all the Shiite parties enrolled in the National Alliance, but ISCI, in particular, has been critical of the move, which is natural given its own strong influence in IHEC. Then, on Saturday, Maliki is supposed to address parliament on the issue of reducing the size of his government. Once more, the solution he is proposing do not seem to have a clear constitutional basis (according the Iraqi constitution, each ministers will have to be voted out through an individual vote of confidence). The parliamentary response in both of these questions will serve as an indicator of Maliki’s parliamentary strength as the pressing issue of the security ministers continues to linger. In his postings on the website document.no, Anders Behring Breivik comes across as an articulate and intellectual commenter. However, his writings also reveal an extreme leitmotif of an alleged grand conspiracy between most of the political establishments in Europe (often referred to as ”Marxists”, but also as “multi-culturalists”) and Muslims that are aiming to change Europe in the name of multi-culturalism. In their most pitched versions, Breivik’s postings merge these two concepts and refer to “multiculturalists” as the “facilitators of the jihadists”. It is clear from at least some of his comments that in the Norwegian context, Breivik sees the ruling Labour party (which was targeted in the Utoya attacks) as an important vector of that dreadful “multi-culturalism”. Central to Breivik’s analysis is the concept of “dhimmitude”, which he has apparently picked up from one of his main inspirations, the Norwegian blogger Fjordland, who is a long-standing critic of Islam and political Islam. Fjordland in turn borrowed the concept from Israeli writer Bet Yaor. Dhimmitude is a reference to the status of non-Muslims in the Ottoman Empire, where they were protected but also lived as second-class citizens without the same rights as Muslims. Breivik uses this concept to make sense of his own teenage experiences in Oslo’s East End, where immigrants dominate several neighbourhoods and are increasing their demographic share. In Breivik’s view, this involves a process of growing “dhimmitude” or second-class citizenship for the remaining inhabitants of non-immigrant background. People in these areas, according to Breivik, must increasingly conform to Islamic ways of life and norms rather than to Norwegian law. Of course, Breivik’s estimate of “80% Christians” in Lebanon in 1911 is as problematic as its identification on a map one decade before it came into existence as a country. Or as those growth figures of the Muslims – truly remarkable as Breivik says, but might that have something to do with underestimates of Muslims in early accounts, different growth rates and emigration patterns rather than with “demographic warfare” as Breivik alleges? And who are those omnipotent Christian Marxists of Lebanon anyway? But Breivik keeps going back to his Lebanon argument again and again (and its main source: Mark K. Tomass, whose 1997 journal article on the subject has not been quoted a lot by others), also when posting on mainstream websites like that of the Norwegian newspaper VG using a shorter form of his name. “I have never understood why the West focuses so disproportionately on Iran compared to Saudi Arabia, which after all is the most powerful and most dangerous Muslim great power. True, we should bomb those suspect installations [in Iran] but other than that we need to focus far more on Saudi Arabia. Could this have to do with the fact that Iran is not a big oil exporter? In other words, Breivik is somewhat clueless about the Middle East, but not more clueless than, say, an average US politician. Many of the sources he quotes copiously, including Daniel Pipes, are well-respected in the US public debate about the region, and the idea of Shiism as “the good Islam” and a potential ally for the United States circulated among many think tankers in the early days of the Iraq War. Like many respectable politicians, Breivik voices support for Christian separatism projects worldwide, including southern Sudan. He expresses sympathy with Lou Dobbs with reference to the way in which he was forced to leave the CNN. Also, contrary to what many newspaper reports claim, he explicitly criticises Nazism, both for its genocidal actions as well as its state-centred economic theories. Rather, it is in his postings on Norwegian affairs that Breivik’s one-sided, black and white and extreme master narrative becomes most evident. He complains, “100 Norwegians have been killed in racist/Jihadi murders during the past 15 years without getting attention, but a single murder committed by a Norwegian racist prompted a vigil of 50,000 participants and the establishment of a commemorative fund”. To most Norwegians other than Breivik, it is difficult to see the “jihadi” motive in those murders, which may well have no other aspect in common that they were committed by people with an immigrant background. But with his conspiracy theory, Breivik sees a jihadi plot and externally imposes a motive of jihadism in every action by immigrants and their supposed native collaborators. Similarly, in a pun which perhaps should have made alarm clocks go off, Breivik describes former Norwegian prime minister Gro Harlem Brundtland as “murderer of the Norwegian people”. By the time Breivik posted his last comment on Document.no in late October 2010, he still seemed focused on a practical action plan for furthering his political views. Some of his posts feature calls to like-minded people for winning control over newspapers and NGOs as part of a long-term strategy. Some of his sources of inspiration, such as Fjordland, have previously been explicitly anti-terrorist, and he himself highlights the Tea Party movement in the United States as a hopeful model to follow for European right-wingers (to some of whom he appears to have established links). However, Breivik’s take on Middle Eastern issues at document.no are strikingly similar to a far more radical English-language manifesto, “2083: A European Declaration of Independence”, that was released on the day of the Oslo bombings and has since been attributed to him, although parts of it are clearly lifted from other sources. The document repeats many of the themes of Breivik’s postings at document.no, including a paranoid fear of the Mediterranean initiatives of the EU as a door-opener for an Islamic conquest of Europe. There is also more detailed commentary on the Middle East, with quotes supportive of the idea of a Christian federal region in Iraq as well as the Syrian Baathist, Allawite-led regime, because of its protection of Christians! But the action plan in this second document is far more chilling and foreshadows the violence that was unleashed in Oslo on 22 July. Whether today’s alleged mass murder already coexisted with the armchair generalist who wrote far-fetched but moderately eloquent postings on document.no in October 2010 or whether Breivik was subject to a subsequent process of radicalisation that concluded with his violent attempt at declaring “European independence” remains to be seen. When Iraqi politicians finally formed a new government in December 2010, nine months after the parliamentary elections, many voices in the international community were congratulatory. Observers emphasized that the Iraqis had managed to create an “inclusive government” in which all the different ethno-sectarian groups in the country were represented. Critics of the deal that led to the formation of the second government of Prime Minister Nouri al-Maliki pointed out that it simply papered over persisting conflicts among Iraqi politicians. It also produced an oversized, ineffective, and unstable government with lots of unnecessary, bogus ministries (including such portfolios as civil society and the southern marshlands), whereas ministries that were truly needed, especially relating to national security, remained unfilled. Eight months on, it seems the critics got it right… Full story here. Comments section open as usual below. Remember the special appeals court for de-Baathification cases? That’s the Iraqi judicial entity of seven judges that came into existence in January 2010 in a supposed attempt at harmonising the laws in force on de-Baathification with the process of vetting candidates for the March 2010 parliamentary elections. Of course, that attempt failed miserably and resulted in gross miscarriage of justice against hundreds of candidates, including such prominent Iraqiyya figures as Salih al-Mutlak who was barred from participating on the basis of a non-existing law. While it is true that the Iraqi federal supreme court must shoulder ultimate responsibility for the failure to apply due legal process to the mechanisms of electoral candidate approval back in early 2010, the de-Baathification appeals court also played a certain role. However, after the parliamentary elections the court has been less prominent and the reason is very simple: After two judges were pensioned and one was killed, by September 2010 it no longer had any quorum to make decisions. Early attempts by the Iraqi parliament to install replacement judges were aborted thanks not least to the efforts of the militantly anti-Baathist Bahaa al-Aaraji of the Sadrist movement. Last week, another attempt was made (the Sadrist are also worried about the lack of quorum on the court, since “Baathists continue to serve in government”), but again the process ran into trouble: Only two new judges were approved, whereas two others were left unconfirmed – ostensibly pending the examination of their curricula vitae by parliament, but with rumours about past Baathist ties swirling around (and with Maliki allies in his State of Law alliance featuring prominently in the proliferation of those accusations). The process of filling the appellate bench with new members illustrates the problems of reconciling old Iraq and new Iraq. The two judges that were cleared by parliament last week were Jalil Khalil Shakir and Sulayman al-Qaradaghi. Judge Jalil is a Fayli Kurd and his approval by parliament was loudly celebrated by Fayli Kurd media of a rather ethno-sectarian calibre: They even forgot to mention the outcome of the remaining nomination attempts! As for Judge Sulayman, his family name (Qaradaghi) could be Kurdish and could be an indication that he is a replacement on an ethno-sectarian quota basis for the Kurdish judge of the previous bench that was killed. But two of the other judges that were also likely nominated on an ethno-sectarian quota basis were not approved by parliament. This applies firstly to Numan al-Bayati, whose family name sounds Turkmen and in fact is the same as one of the retiring judges (Hamid al-Bayati). The second case relates to Yas al-Saadi – was he intended as replacement for the retiring chief of the court, Muhammad Sahib al-Khafaji? 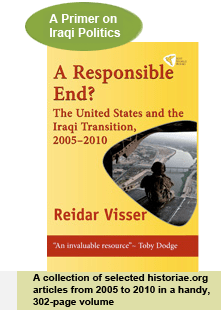 In those cases, despite the quota imperatives, legacies of the past were not readily accepted by parliament, once more underlining how the previous regime was so much more than a bunch of relatives of Saddam Hussein from Tikrit. More broadly, this relates to a general problem that has delayed the passage of a new law for the federal supreme court: In Iraq, it is almost impossible to find qualified judges with decades of experience that do not have any ties to the past regime. That in turn has prompted some of the Shiite Islamist parties to demand changes to the draft law on the new supreme court (which was prepared by the existing court). In particular, they want lower service thresholds for nomination to the new court. Unless the Iraqi parliament can find pragmatic and consistent solutions for incorporating professionals that served in the previous regime, it is unlikely to be able to pass legislation on a new federal supreme court at all. In that sort of context, the old court and its various appellate institutions will continue to serve – with the legitimacy problems and susceptibility to political pressure that come with its own genesis during the days of Paul Bremer back in 2003–2004.